“Why’d they call you Tau-Hand Harry?” The prisoner drummed his wrench against the wall they were hiding behind. Twenty inmates had broken out from the Gualtiar Military Prison, aided by a rogue PDF unit who had apparently got some friends in high places. The rendezvous was an oasis some distance from the camp, marked out by a cluster of ancient habitats around some even more ancient ruins. Rumour had it there were some kind of metal men in the depths of the pyramid, but that seemed the sort of stupid talk that would scare children. They called themselves the Cult of Doom, a brutish band that had formed around Juvius, a charismatic conman who really was the one who had convinced them to escape. It had been his idea to get the local PDF on board, and that had really been the turning point. When the guards were helping you escape, breaking out of jail was easy. 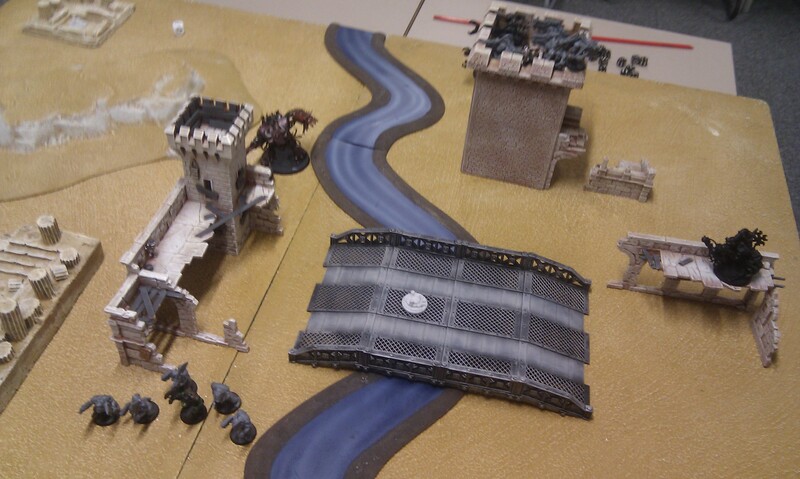 The oasis was apparently deserted, and Juvius was closing in on the PDF officers – a scrawny psyker and her bodyguard. “And what’s this “job” you’ve got for us then?” Juvius was beginning to get concerned. The sun was suddenly blotted out by something looming behind Juvius. Something big enough to block the desert sun. Something Juvius had only seen in propaganda films during his childhood in the underhive. Bad news. Harka hadn’t planned to start a war on Gualtiar but sometimes fate worked in mysterious ways. It was full of pretty tough humans that he was sure to look good for killing, but not so tough he was in any danger of losing. While, like any ork, he loved a fight, he loved a fight he could win even more. As a result, Harka had brought his toughest lads to one of the few oases in the desert ready to take down the humans. He’d got a properly clever plan, one which involved all the varied elements of his force working together with great precision in order to storm across a low bridge and tear everything apart at once. Explaining it to the lads was proving difficult. 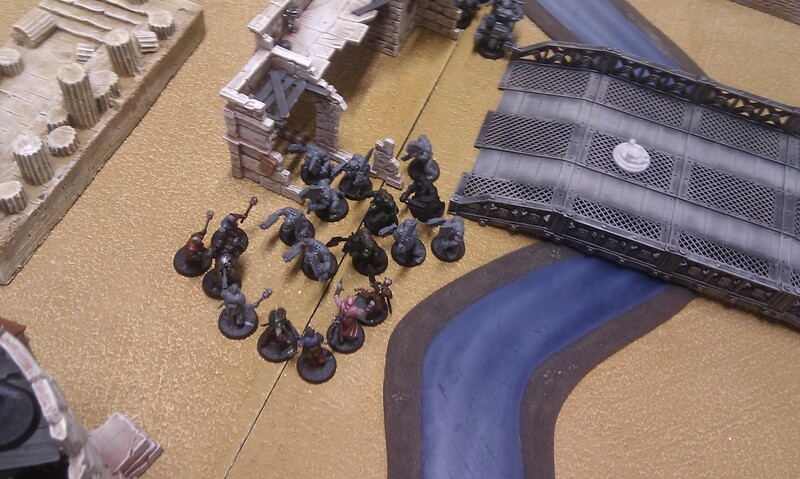 A gang of orks suddenly burst into Harka’s tent in a mad panic. There were humans everywhere. Harka could see small runty ones in rags, and flash looking ones with well-maintained guns manning the walls of a half-collapsed tower, and even a big shiny one in armour. But best of all was a massive dreadnought a bit like Gorken, his own. He’d told the lads whoever killed that would be a hero. His troops began to move up, firing everything they had at the waves of enemies, and to Harka’s dismay missing every single shot. That was fine, though. He had a plan. The mechanics had given him a big, flashy looking gun they said would smash things good. He lined it up, just like they’d said to do, and fired. Nothing happened at first, and he wondered if the gun even worked. A few seconds later an expanse of sand suddenly exploded in green light. It might pull to the left a bit, boss. Juvius was terrified. The human witch had taken Claw’s gang and sent them off one way, leaving him and the Cult of Doom under the watchful eye of the thing that had threatened him. Normally, anyone who threatened Juvius would be introduced to the Welder, but, Emperor save him, that was a space marine. A Chaos marine at that. This wasn’t one last job, this was suicide. Those PDF had sold them all down the river. He’d heard about what these freaks did and to be honest it made the underhive “surgeons” he used to use as interrogators seem like small fry. Not that the PDF cared. They were doing their thing as Guardsmen, firing and missing at enemies that presented themselves. If there was one thing that made Octavia’s skin crawl it was the sense of utter corruption that the thing on the hill gave off. Not that she was ungrateful – a hail of shells that had burned like tracers in a sickeningly bright purple-and-green hue had ripped the legs off an ork dreadnought she had seen on the other side of the river. But it was doing something else. Its influence was making her powers burn more brightly – more strongly. Spittle-flecked Orks on crude motorbikes were speeding towards Claw’s gang and with an effortless thought she threw them off course. She could understand why someone would seek that sort of power now. It didn’t hurt any more. An ork truck had emerged from behind a ruined guardpost and was bearing down on Juvius, its passengers firing their pistols from its windows. 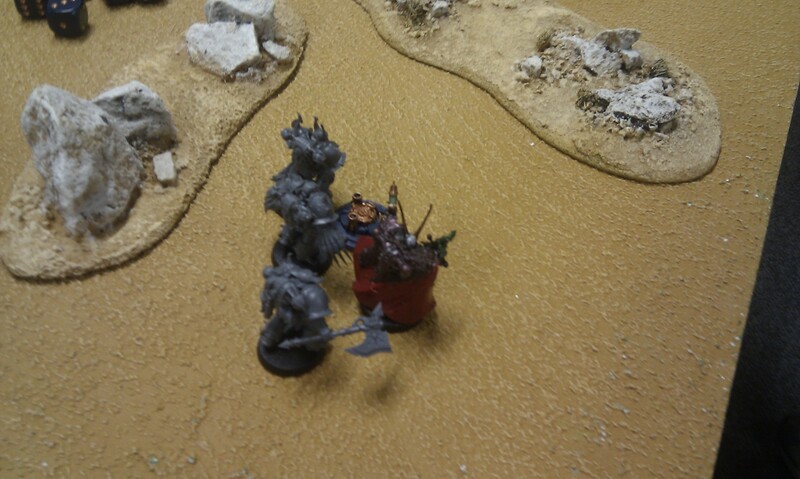 He was about ready to turn tail and get back to the safety of his low wall when the space marine pointed at it. 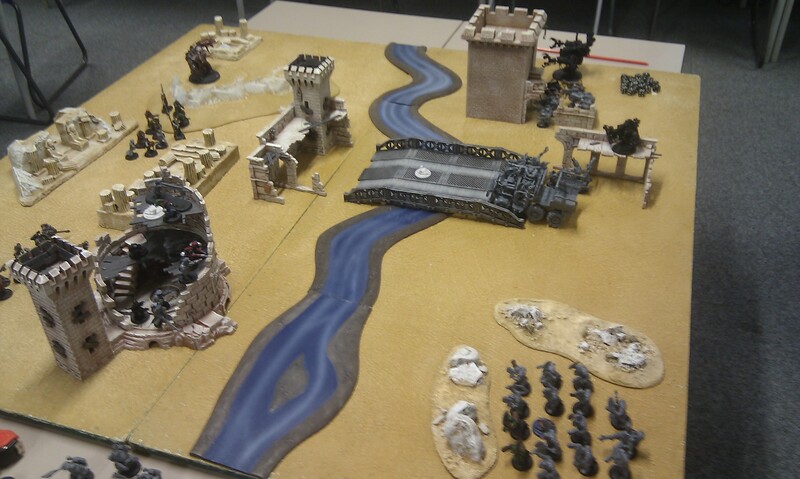 The Cult of Doom swarmed over the truck, avoiding the clumsy shots of its ork crew, trying to find the weaknesses in its armour. While they distracted it, the squad’s new minder with almost leisurely ease planted an armoured gauntlet so deeply into the vehicle’s side it found the fuel tank. Juvius felt a wave of heat wash over him. That was the last thing he felt, in fact, as the truck’s fore section exploded in a spectacular fireball. Nobbla, boss of the Truck Boys, was thanking his lucky spanner that he’d spotted the big chunky human about to punch his fuel tank and told everyone to get clear. Now, his lads were slightly charred but ready to sort out the humans that were standing around the wreck of his truck. They charged. As his lads cut through the humans with ease, smashing the ragged militia into bloody smears on the sand, he singled out the boss of the enemy’s mob and shouted a stream of curses at the armoured figure. The language of a challenge was universal, though, and it rounded on him, power fist crackling with energy. Nobbla’s own claw was charged and ready, and the pair rushed at each other clumsily. The ork felt the blades of his claw slip through the enemy’s armour and then to his horror stick there, the gore sucking at the edges of the wound. With his dying strength, the Chaos Space Marine brought his own power fist to bear and jammed it into Nobbla’s guts. Claw hadn’t quite seen everything but shortly after the big explosion he’d heard a lot of screaming over the radio, and now Juvius wasn’t answering. That was probably bad. What was worse, for sure, was that the crazy witch they were following had just used her mind to literally pick Grunt up off his feet and stick him in the path of an ork bullet that would otherwise have taken her head off. And what was even worse, there were three orks on motorbikes getting closer by the second, they were under the worst hail of fire Claw had seen since the shootout at Perdition Station and all the woman could say was she had it under control. PDF Commander Hesperus hardly mourned the loss of a mob of murderers and thieves. The loss of the single Space Marine was far more worrying, for each of those lost would be held against him by his new lord. That, though, needed to wait. With practiced orders, he marshalled his unit against the regrouping orks and with great pleasure wiped half their number from existence in a volley of las-fire. According to Octavia, her own little band were in a prime position; under heavy fire but ready to counter-charge. He gave the order unthinkingly, knowing that within minutes his lord would make his move. Octavia ordered her men to charge the ork bikers at the same time as with a screaming of gears the Chaos war machine made the same decision. She couldn’t tell if the thing was intelligent, or simply an easily-pleased stupid brute. The orks, she knew, were simply stupid. They fired their pitiful weapons at the wall of metal bearing down on them and chose to ignore the other humans running in at its feet. Filled with psychic energy, she rounded on the largest ork and challenged it to single combat, which it gladly and predictably accepted. However, the gifts of Chaos are unpredictable. Octavia felt her power ebbing even as the ork closed in, and all she could do was weakly stab at it with her staff. Even so, that had bought some time for the war machine to do its work. A very, very long time ago, Grimaldus had been human. Not human. More than human. Astartes. Then had come something. The Doom, they had called it. The Doom of Malatai. It had taken Grimaldus’ eye, and his arm, and they had said his sanity. But at that point – when he had been left for dead and all hope had been lost, something had kept him alive. Now he lived. Fought. Was more than he ever had been before. The orks were nothing before him. From the way they fought they thought they were invincible, but Grimaldus knew nothing was invincible. Everything died in time. Hesperus saw Grimaldus and the sea of gore that had once been a wing of ork bikes on one flank, and on the other a flickering storm of lightning that marked his lord’s arrival. Corac Storm, Tyrant of the Seventh Moon, arrived on Gualtiar in grand style. A mob of orkoid creatures was before him, and his sword called out for blood. The massacre was pleasing to the gods. Not one ork lived. That was not to say they had not fought nobly, for their leader had cut down two of his brothers, but the Blood God cared not whose blood it was that was spilled. Harka watched as his experimental gun fizzed, sparked and burned out completely. 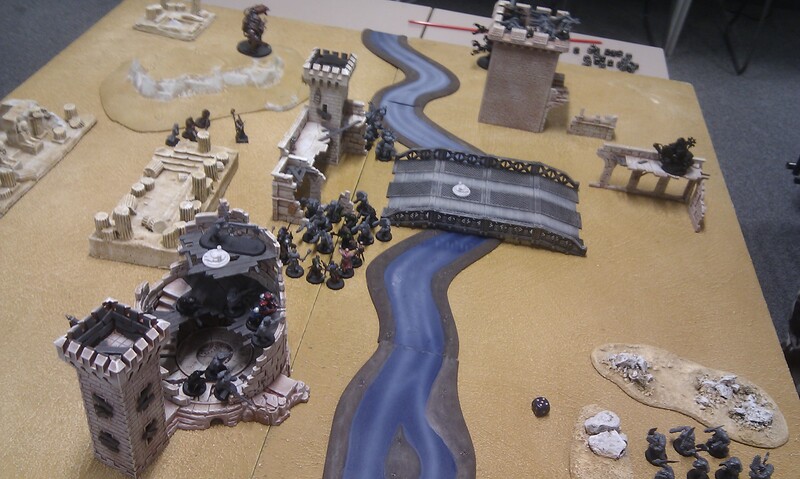 Nobbla’s team were running away, Smasha’s were cut to ribbons, Hazzad’s bikes were a green smear on the dunes and apparently his looters were running out of bullets. Harka was not a stupid ork. He ordered one final volley on the isolated humans, and then told everyone to run away. They would come back and smash the spiky, armoured humans another day. Nothing remained of the Cult of Doom, or the Claw Gang. The Witch Octavia was dead. Hesperus didn’t care. Blood had been spilled in the name of the Red God. Lord Corac was pleased. Where the escaped convicts had died, the bloodied sand was beginning to burn lava-red. Corac Storm. Tyrant of the Seventh Moon. Doom of Gualtiar. And Avon Hesperus, the man who would stand at his right hand. He had never lied. The Claw Gang and the Cult of Doom had indeed been freed for one last job.